The Runner's Cycle of Suffering. And How to Break It. Runners are an impatient lot. The determination to get faster can quickly turn into dissatisfaction with what we have already achieved. One of the virtues we all have to develop in order to reach our potential as runners is an ability to control this determination and keep it from turning us towards self-sabotage. 1) The runner who has been going through the motions decides to train harder and smarter and better. 2) Fitness and results follow fairly quickly, and the runner gets excited to be "in shape" and running well. 3) Out of this excitement, the runner sets an ambitious goal, usually hoping that his development will continue at the same rate that it has started with. 4) Motivated by both the excitement of being fit and the thrill of the ambitious goal, the runner begins to train even harder. 5) Now, training harder than he has ever trained, more ambitious than he has ever been, the runner starts to get fatigued and anxious that he will not meet his goal. 6) The fatigue and anxiety mount even further, as workouts begin to stagnate and the line of improvement decelerates. 7) By the time the goal race rolls around, the runner demands of himself a series of super-human workout efforts in order to achieve his ambitious goals, placing too much hope in a last-minute workout or in the taper to save him from his fatigue. 8) The runner finally races the goal race and probably doesn't run a ton better than he or she did way back in step #2. This runner concludes that he is simply not talented enough to achieve his ambitious goals because there is no way he could have worked harder or put more into a racing cycle. 9) After the race, the runner feels tremendous relief not to be training anymore and falls back into "just running" and going through the motions. 10) Eventually, maybe 3 or 4 months later, finally mentally and physically recovered from this brutal cycle, the runner finds motivation to return to step one. Sound familiar? Story of my life. The Buddhists call the cycle of suffering the wheel of Samsara. Enlightenment is release from Samsara. How to break this cycle of suffering? The key is noticing that the main causes of the down-spiral of the cycle are the very things that are positive about it on the way up. The demise of the runner is almost never laziness or lack of motivation. The demise of the runner is caused by the very things that make us runners: our enthusiasm and ambition. Yes, you heard me right. Enthusiasm and ambition are the primary impediments to intelligent training. That's because the very same forces that we call "enthusiasm" and "ambition" are what we later--towards the end of this cycle--call "overdoing it" and "stubbornness." We need to turn enthusiasm and ambition to the proper ends so that they remain enthusiasm and ambition instead of turning into their bad news counterparts. The key moment to identify is early in the cycle, around steps 3 and 4. We are most dangerous to ourselves when everything is going well. Let me explain by making an extended analogy to accelerating in a car. In the early stages of training, everything "sticks." That's because we are in first gear. We get faster very quickly, and the engine is happy to rev up pretty high. The enthusiastic thoughts creep in. Man, if I am getting faster this quickly...how fast can I get? There is a temptation to stomp on the gas. However, if we do that, we don't accelerate much faster at all. Instead, we just send the tachometer to the red line. In order to get to second gear, we've got to take our foot off the gas and switch gears. Whenever we shift gears in a car two things happen. First, the acceleration slows. Second, the duration of acceleration is extended. We essentially make a sacrifice in short term acceleration for long term improvements in velocity. The same exact thing must happen in training. The very moment when the acceleration of training is the highest and most thrilling, when the engine is revving loud and strong, is the moment when it's most important to step off the gas and switch gears. We need to tone back the enthusiasm and ambition, get the tachometer back down to a sustainable level, quit trying to maintain acceleration and worry more about improving speed over the long haul. If we don't make these changes, we get stuck in first gear, revving the engine high, but not getting anywhere fast. If we keep feeding the engine gas, we even risk blowing up the engine, either in injury or overtraining. 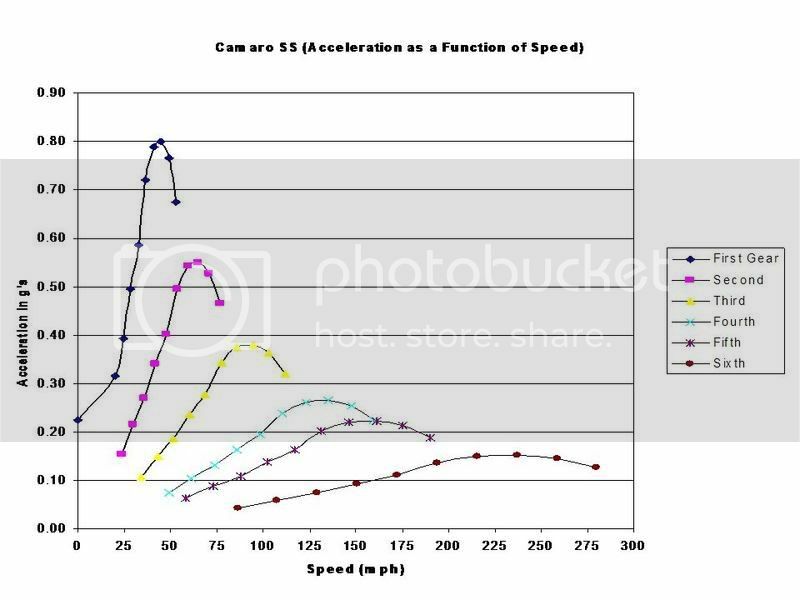 This is a graph of acceleration vs. speed for a Camaro in the different gears. You can see that as you go up through the gears, acceleration is traded for velocity. The ideal moment to shift is somewhere just before peak acceleration. If this happens time and time again, we start to believe that we are "first gear" runners. We look at the guys who have it in third, fourth, and fifth with envy, as they cruise effortlessly on the highway. That envy can make us floor it, trying to keep up, hoping that if we rev the engine hard enough, we can go 55mph in first gear. That's false hope and misguided ambition. If we do manage to get the car up to 5th gear, challenges still remain. Acceleration in 5th gear is really hard, and if you experience a setback, sometimes you even need to downshift for a while. We can only stay in fifth gear as long as the road is flat and smooth. Even then, advances are slow and take steady work over a long period of time. You never get to experience again the thrill of rapid progression when you are a first-gear runner. If you've done the right sort of self-work, though, you are able to find pleasure in the longer journey, in the small victories, and you are able to see that the cheap thrill of quick improvement is just that: a cheap thrill. Okay, enough extending of the metaphor. The point here is simple. If we want to reach our potential as runners and avoid the cycle of suffering, we need to choose a sustainable approach to training. That's no great insight. But sometimes simple things are hard to put into action. If you remember back to when you first learned to drive a manual transmission, shifting gears was the most unnatural and difficult act. Once learned, though, it becomes one of the joys of driving, as it allows us to smoothly and consciously control the transformation of power into velocity. Eventually, as we mature, we learn to appreciate our automobiles less for the loudness of their engines or their ability to lay rubber, and more for their responsiveness to road conditions. They may not sound tough or leap off the line. But they get us more reliably where we want to go. This might as well be the story of my entire life! From May of 2009 through Nov 2010 I went from a 3:29 marathon to a 2:45. Since that 2:45, I haven't come close to that time. I am absolutely stuck in first gear, and red line that engine all the time! Though my next plan has a "gear shift" built in. Here's to hoping it works, and I don't get tempted to floor it when I need to shift. First off, that's incredible progress in a short time. Holy crap. A friend of mine always jokes about the marathon mind f*** after you run a good time. Sounds like you got it pretty bad. But it also sounds like you are ready to take it to the next level. It's just a matter of time. After my first mile or so, I learned to push it hard going up hills, get winded as all get out. Then slack off on the down hills, and get my wind back. Then go back to my almost best speed. In this way I improved my endurance and speed of 6 minute miles. Worked for me. I love the post - pretty damn close to my spring season last year. Back to training smart this year and what do you know, feeling 10x better and running faster! Yes, I am reading this again to make sure I do not get ahead of myself and let enthusiasm lead the way. I started this year conservative and the "less is more" road to attempt running times from last spring. I'm not there yet, but my most recent race was faster than expected. I am all to aware of the ambition signals, but I'm also aware of the pains and tweaks that can follow a race. I need to be smart, get recovered not over do it in the final 7 weeks before the marathon. I'm going in with an open mind but at the same time we have that "goal" we'd really like to meet. Thank you for these words to keep me grounded, I needed them today. Please stop writing about me. Lovely post. I'm bookmarking you, and looking forward to more!